The tender+ functionality is designed for large volume calculations of transport legs from loading to the unloading point. The logistics tender management feature is fully integrated within PTV Map&Guide internet cloud service. Therefore no installation or updates are required. A comprehensive user interface is available for uploading and downloading data and for setting all relevant calculation parameters. Consequently, no interfaces have to be connected or calls executed via the command-line. The calculation runs in the background even when you log out of your PTV Map&Guide internet account, close your browser or shut the computer off. Once the calculation is completed, tender+ informs you via the in-app messaging or email notifications. The logistics tender calculation is available in Excel format. When it comes to preparing quotes for any logistics tenders, manual calculations can set you back behind your competitors. 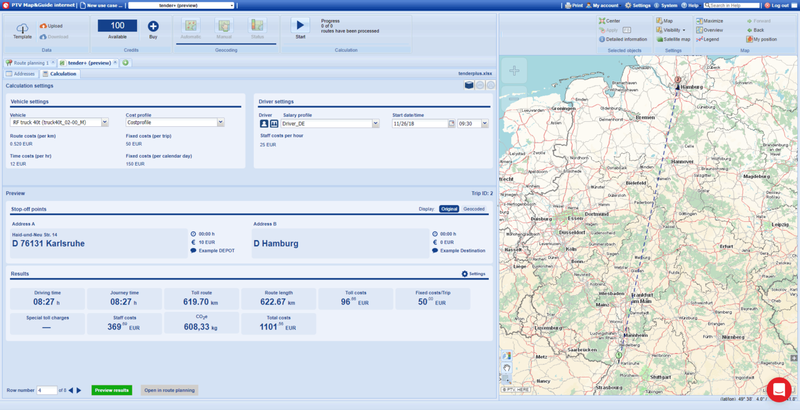 Not only you are ahead with tender+, but you can also rely on its fully accurate calculation as it always uses the latest map material as well as current and future toll costs. With the logistics tenders management feature, tender+ supports you in making the right decision in the supply chain management. It creates benchmarking of mileage, costs, driving, and travel times of different vehicles so you can decide which business offers the best, most cost efficient for you. Additionally, you can also calculate shipments that have been carried out, so you can create break-even analysis and customer profitability reports. It is available for all customers in Europe with a base subscription for PTV Map&Guide internet. You will first receive a limited contingent of free calculations to test the logistics tenders functionality. Geocoding and calculation for one transport leg from loading to unloading point are considered as one calculation. Once the free calculations are all used up, more tender+ calculations can be purchased as an annual subscription. Our local sales teams will assist you in selecting the most suitable offer for your needs.